TRENTON, N.J. -- A federal appeals court has refused to halt a beach replenishment project in New Jersey that led to ponds of bacteria-laden water after a storm. Judge Thomas Vanaskie, writing for the 3rd Circuit Court of Appeals on Tuesday, denied Margate's request to stay a lower court ruling that allowed the U.S. Army Corps of Engineers to continue. The lower court also had ordered the Army Corps to fence off any areas with ponding of 2 or more inches of water, along with other conditions. Rally held against dune project in Margate. Christie Ileto reports during Action News at 11 p.m. on August 13, 2017. 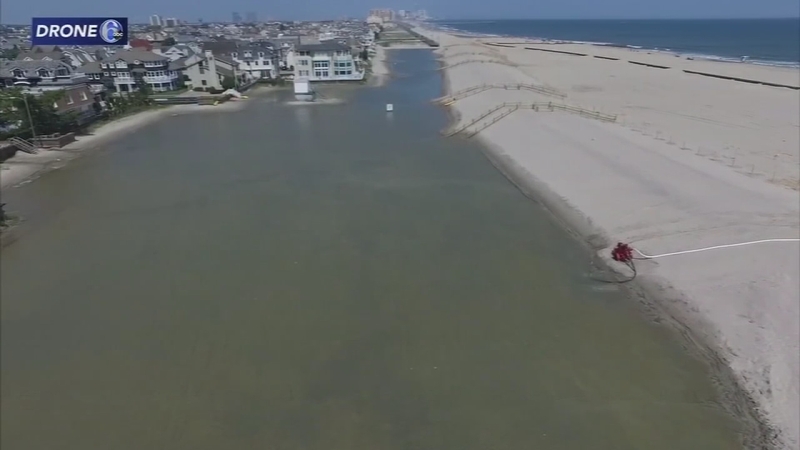 The ponds are exactly what Margate residents had warned of in previous, unsuccessful litigation against the government's plan to build the protective sand dunes at the coastal town south of Atlantic City. Watch the report from John Rawlins on Action News at 5 p.m. on Aug. 11, 2017. A lower court on Aug. 10 overturned a state judge's ruling and granted the request by the U.S. Army Corps of Engineers to let the project in Margate continue. The work is part of a statewide effort to protect New Jersey's 127-mile coastline following the devastation that Superstorm Sandy caused in 2012. But Margate has opposed it as unnecessary and harmful to its shoreline, and now a public health hazard.